A soon-to-be big sister and her parents prepare for the arrival of a new baby in the family. Alternating panels depict what the family is experiencing in tandem with how the baby is growing, spanning everything from receiving the news about the new baby to the excitement of its arrival. In this pregnancy book unlike any other one out there, watch what's actually happening through meticulously detailed, actual size illustrations, perfectly paired with a lyrical yet informative text, and culminating in a warm, joyful birth scene. 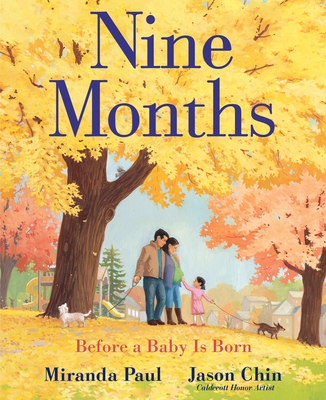 Complete with backmatter that includes an elaboration on pregnancy, a list of amazing things babies can do before they're born, and more, Miranda Paul and Caldecott Honor Artist Jason Chin deliver another spectacular nonfiction picture book. Miranda Paul is an award-winning author of children's books whose work includes Water Is Water (also illustrated by Jason Chin), Are We Pears Yet (illustrated by Carin Berger), and One Plastic Bag: Isatou Ceesay and the Recycling Women of the Gambia. She lives in Wisconsin. Jason Chin is a celebrated author and illustrator of children's books. His book Grand Canyon was awarded a Caldecott Honor, a Sibert Honor, and the NCTE Orbis Pictus Award. His other acclaimed nonfiction titles--Coral Reefs, Redwoods, Gravity, and Island: A Story of the Galapagos--have received numerous starred reviews and other accolades. He is also the illustrator of Stephanie Parsley Ledyard's debut title Pie Is for Sharing, which has received four starred reviews. He lives in Vermont.